My cutting table was looking too pretty this morning not to take a picture. I’ve been pulling for a Spring quilt and I think I finally have my choices just right. The top fabric is an Amy Butler print and it has so many other great colors in it, perfect for pulling a colorful Spring quilt together. Anyways, what was I saying…I also have baby girl quilts in the works with fabrics pulled and ready to be cut. I refreshed my solids stash this week and bought this beautiful bunch of the new Cotton and Steel solids. They feel just like the Cotton and Steel print fabrics, and also identical to the Bella and Kona solids…but these were a little bit cheaper (yay!). I had a hard time resisting ALL the colors. My goal last month was to finish up this “fish” quilt top. 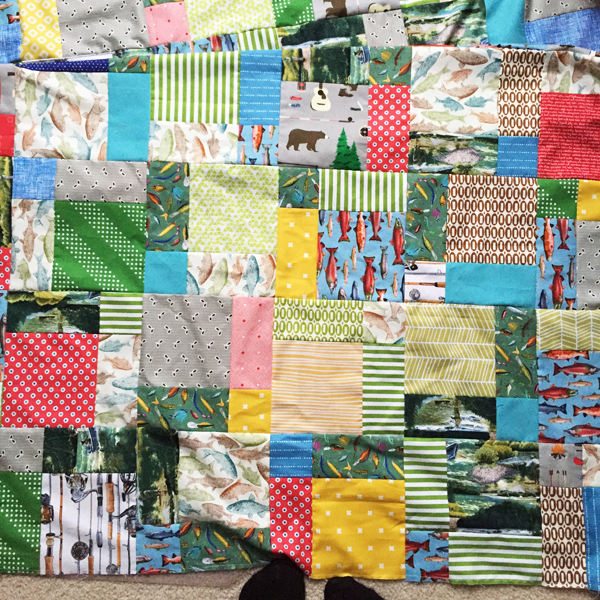 It’s not the most beautiful quilt I’ve ever made…but I have a soon-to-be 9 year old who is going to flip over it. It took me 3 weeks to finally force myself to sew these blocks together. Why is so hard to make myself sew something I don’t really want to sew??! I used my Easy Bake Pattern but cut the initial squares 9″ and the other cuts 3″. I had 1/2 yards, so that way I could get 8 – 9″ squares from each 1/2 yard. You could also make a huge disappearing 9 patch and get this block look. It turned out very fishy…perfect for a fishing obsessed kid. Kathy already quilted it and it’s on my way home to me…so I’ll show you a better picture soon. Great fabrics. I’m intrigued by the frame which seems to be holding your rulers. How did you do that? It came like that as a bulletin board from TJ Maxx…it has the perfect space to fit my rulers in and keeps them in place! Such pretty spring colors, sure to make something great! A nice bunch of solids too, always so handy to have around. I’ve been buying solids also!! Paint your walls white!! Mine are white but full of my Grandkids Art! I always look forward to your projects. I just finished one! Great feeling isn’t it? Perfect quilt for your fisherman son. Best Salmon from the West Coast :)! Beautiful solids and print fabrics! So pretty! As a side note, we are in the process of adding a sewing/quilting studio to our home. I have been debating on wall colors and finally decided on light gray. I saw your post and thought the wall color was perfect. Then you mentioned you want to paint them white. :) I think I am still in the gray color mode. Thanks for sharing. So funny, I really like this pattern because of the warm colors, even though I might not pick out fish. When I looked at the pattern for sale, the reds are just not my style and that put me off the pattern. It is so great to see a variety of fabrics used for the same pattern! I’m going to give it a try now. 112 days, huh! I’ll have to mark that on my calendar too. About your grey walls and needing white for photos: Keep the grey walls, they look nice, especially with all your lovely bright prints. For table-top photos, get a white foam-core science-fair style presentation board, the kind with side panels that open out, and use it as a photo background. The side panels will help to bounce light onto your photo vignette. Ha…Im married to a fisherman. He watches our rivers rise and fall….and makes sure he lets me know, and when the fish are running. We live by a popular fishing hole (pacific northwest) So, I know all about ‘fish reports’. My sewing room was painted white a year ago. I needed all the lightness I can get. I love it. I’d say go with a lighter gray. White is just boring, but a light gray can be very nice. I relate to your angst over the grey walls. My daughter’s apartment has grey walls AND grey ceilings to match and it makes it so dark! I hate it! Oh gray ceilings too would be awful!! Especially when you know you can’t paint it! A over with so I can move on. The grey walls are beautiful! I paused over that picture for quite a bit, I love the color of the frame with that grey, the whole area looks light *and* cozy. Bottom line is that it’s your space. I think it photographs well, I love the colors against the grey, but how does it feel to spend time in? I hate sewing things I’m not interested in, and even when I am, I need to finish quickly or get bored, then procrastinate, anyway. I’ve been “working” on window shades for my living room for several months, haha. Oh that really made me laugh that you have a Fish Countdown in your family Allison. My brother was like that with April 1st – the first day for trout season. He’d be up before dawn and hiking off with his fishing rod and flies. Your son will really love that quilt – it’s really fun to look at mre closely. 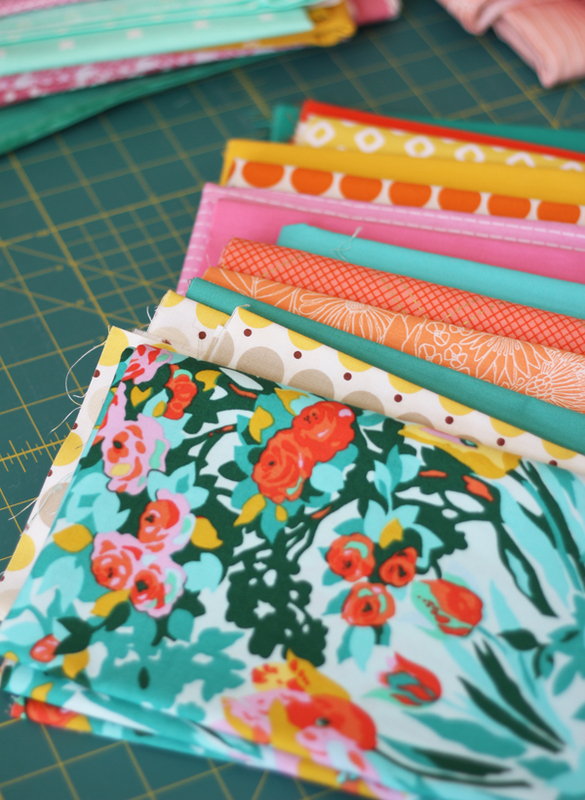 Loving the fabric pull on your cutting table – all those peachy oranges are so appealing mixed with the Amy Butler print. I know what you mean about wanting lighter, brighter walls. I’ve been campaigning for years for our living room walls to be repainted. But your perfect gray does look great with any fabric. Is a change you want just for photos or do you need to lighten the mood in the whole room? Looking at your fabric pull and room, and then all the other projects you have on this page… I couldn’t help but notice how nicely the color of your honeycombed softest sky blue blog page background looks with everything. LOL – I’m not helping, am I? The solid fabrics are delightful. I LOVE color so all these colors make me happy. I would like to offer my opinion about the gray room…perhaps you could paint it a lighter shade of gray, hope this helps and TFS. I have a bunch of tool-related fat quarters I’ve been wondering what to do with. This pattern would be great with a few more ‘solids’ added in. thanks for the idea! I love your grey walls!!! What a nice mom! I’m not a fan of fishing, but great he has a hobby and that you did a cool quilt for him. Thanks for sharing – as always. I do love the fabrics and knowing about the solids with C & S! 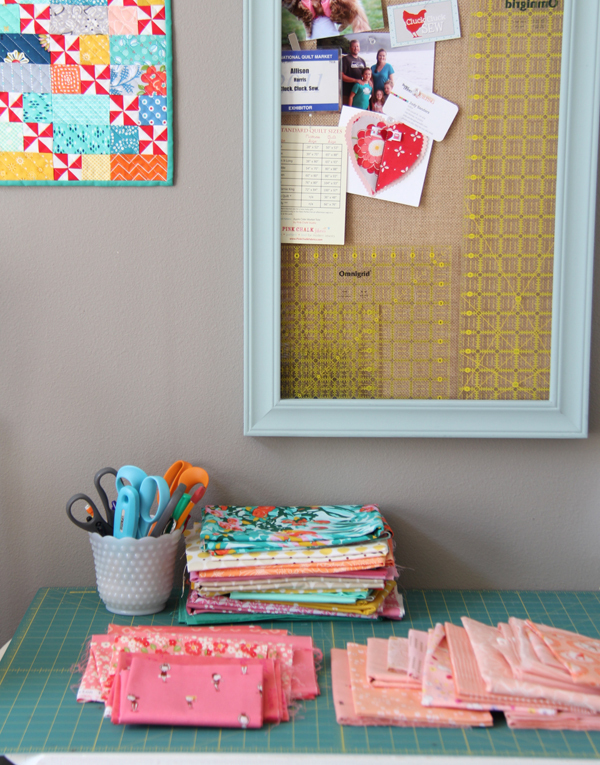 Do you have a pattern for that pinwheel and block small quilt that is hanging on the wall to the left? (of the photo). Looks like half say white and half say gray. I have gray walls in most of my house, but my sewing room is painted a warm yellow. I say go for white and deck the walls with your creations! If it feels dark to you, then it isn’t the perfect color for you (or the room)! I would pick a lighter gray, or a soft color that will “feel” white, but not be a complete absence of color. I’d probably pick a pale aqua, but then the lovely bulletin board and your lovely painted furniture might not stand out as much. And it is hard to finish a project you don’t love – I put something I love to do after the have to do. For example, I don’t get to quilt until I’ve rotated the laundry, or done the dishes, or graded papers, or whatever task it is that I’m putting off. That shadow box to hold your rulers is awesome. 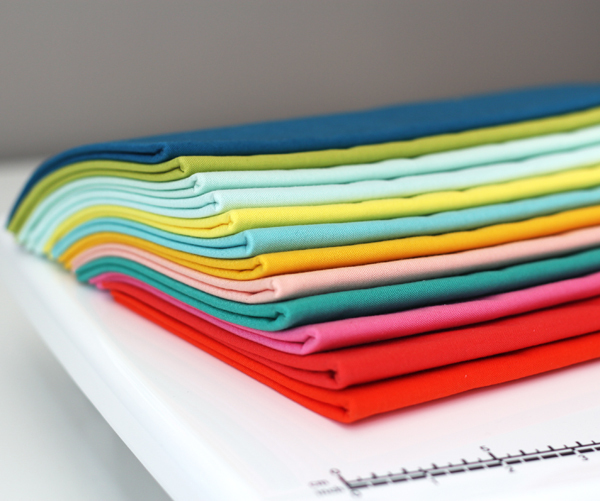 And that stack of solids–perfectly beautiful!! Thank you! Gonna order some! Never tire of your e-mails. The Gingham quilt is sew sweet. As for the gray wall, my parents always had a gray home with white trim and it was always so very proper and I liked it. Walls, are another topic. I prefer color myself. The apt. I live in has all white walls, but, I am going to change that in a few months. PS: Don’t tell anyone. HA Happy Spring and a very blessed Easter Season. I just got the Easy Bake pattern to make a graduation quilt for my very sporty, outdoorsy nephew. After cutting lots of pieces, I decided he also needed some fish! Waiting for my fabric order so I can finish. But I had forgotten your quilt here was all fishy!